Few other cities reflect Chinese culture more clearly than Xi’an! Standing on the Yellow River, located in Shanxi Province, Xi’an – is one of the places where the Chinese nation & culture was born. There, the ancient Chinese created a great civilization comparable to ancient Egypt and India. Xi’an, known as Chang’an (Eternal Peace) in ancient times, has over 3,100 years of history. This brick wall forms a rectangle around the ancient part of the city. 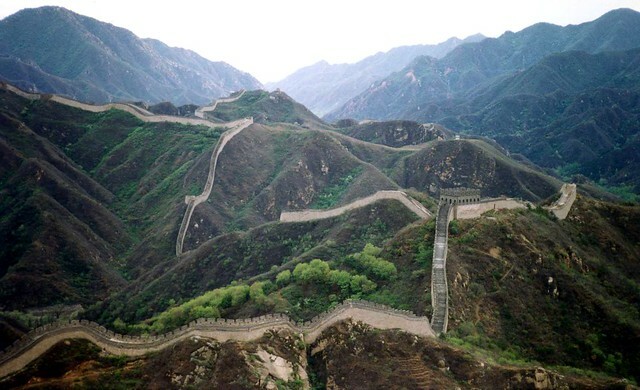 The wall is a towering 12 meters high, 15-18 meters wide, and 12-14 meters at the top. There are gates on each side with majestic towers. The poetic names of these gates only add to the experience: Infinite Calm, Constancy, Eternal Peace and Lowland. Don’t miss an opportunity to ride the wall using bicycles. You can even rent bicycles for two or three people to see these unforgettable views ! And rentals won’t cost you a lot of money: one hour is ~60 RNB ($10). You will enjoy this trip! 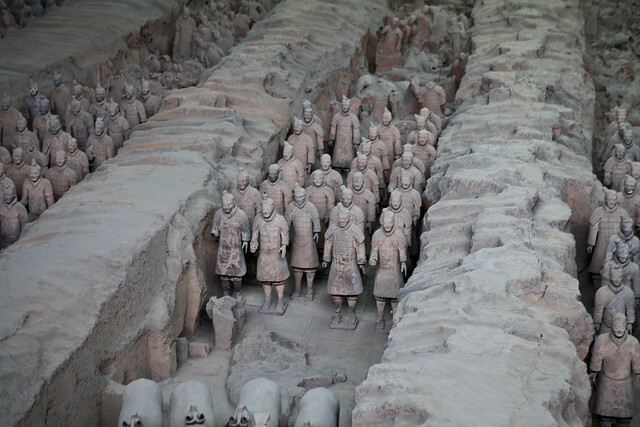 In 1974, nine peasants were digging a well when they suddenly found the Terracotta warriors. Their excavations continued and more than 6,000 ceramic figurines were found. Each full-scale warrior has spears and other weapons, as if he is ready for battle. They are tall (1.8 meters) and dressed in uniforms with rank depicted. They are one of the most popular spots not only in Xi’an, but all of China! Entrance to the park and warriors is only $20 and well worth the visit – You can even see real archaeologists still working on warriors! The Big Wild Goose Pagoda is one of the most famous Buddhist pagodas in China. It was built in 652, although it has experienced numerous changes over the centuries. The modern building has 5 beautiful floors. According to legend, while a large flock of wild geese flew over the region, one suddenly fell from the sky and died. The monks decided that a dead goose was the holy Buddha. Consequently, they buried the bird and built the pagoda named Big Wild Goose Pagoda. Today you can enjoy not only its majestic view but also the wonderful dancing fountains with 20 minute shows every night at 8.30 in front of the Pagoda. This show – with national and classical music – is the largest fountain show in Asia! Melisa Marzett is a travel, history, and geography expert. Her other works can be found online and feel free to contact her at Google+.